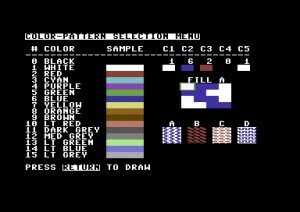 You may now find more paint packages for the C64 than reasons to use them. 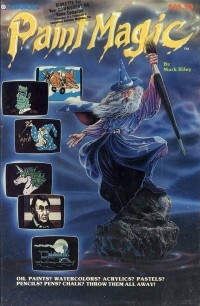 Yet the one and only that ruled back in ’83 was Paint Magic (PM) by Mark RILEY. The splash screen and the box cover art were a bit misleading by focusing on graphic effects that the poor thing couldn’t deliver but this piece of code had some real magic in it. Let me tell you some old jabbering about it. As most of the “true” paint packages for the C64, PM was designed for a joystick. This ancient art of drawing with a 8-axis lever and a red fire button could be compared to some sort of Etch-a-sketch torture art… but it would be a mistake. Especially in lo-def 160 x 200, this input method was real “magic”. I personnaly used a Kempston joystick – an english brand that sold mainly to the Sinclair / Amstrad / Accorn communities – that was quality built around blade contact switches and had a semi-short stick with a round ball at the end and a perfect fire button setting (two large round flat paired buttons right next to the stick). This input system was efficient at drawing lines but was also very effective in laying halftone patterns of pixels. One of the orthers bits of “magic” worth mentioning here is the interface itself. PM is a full screen paint package. To access the command selection panel, you just have to press the space bar once and the screen toggles from the canvas to the palette and back. This interface wonder was never reproduced later as most of the WYSIWYG gurus felt in love with their floating palettes. The core value of this setting was to reproduce the time organisation of the “painter”, switching from his box of colors to his work and back. Of course, shortcuts helped too by reducing the amount of screen switching but this spec induced some “intention” that could be useful to some (especially those who hate to have their work canvas surrounded by bits and pieces of interface). I did a lot of PM and enjoyed it until I met with DeluxePaint on the Amiga. Both tools offered an approach for layout that current graphic package cannot offer. Lo-def, especially in 160 x 200 allowed to sketch a screen, usually in grey on black, and then lay the colors by applying details like on a regular IRL canvas. 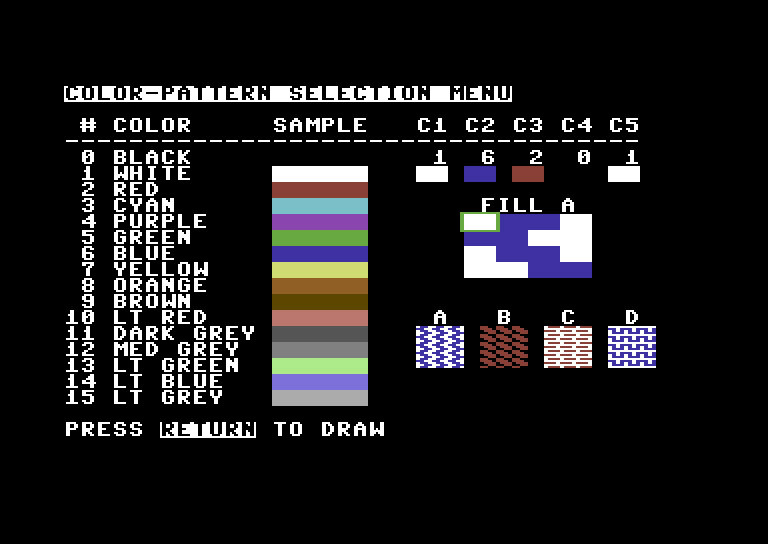 PM was an adorable paint box, allowing color selection by the Fkeys, saving quite fast.  There were so few pixels that it was impossible to mess with edge effects or unwanted antialias. This fine art of the few dots was perfect for icons designers as it forced to apply light – translate “white” – at the very end of the creation process. Lo-res is painting by legos and has a great value in establishing simple composition rules and practices. Any good designer should try it. Hey, would you have by any chance the .tap file for this software? Az3123 : Sorry for the late reply, I’ve added the .d64 file 😉 Have fun!